Right off of Highway 30 in the old NAPA building, diagonal from the new NAPA building. 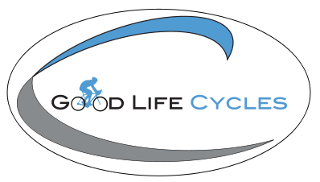 Located within the Cozad Micro Mall, Good Life Cycles provides all of your normal bicycle products and services in the small town setting of Cozad, Nebraska. We sell bicycles, service bicycles, sell products and accessories for cycling, and stock nutrition products for cycling, running, weightlifting, etc from CytoSport (the makers of Muscle Milk), Force Factor PowerBar, Hammer Nutrition, Honey Stinger, and more!